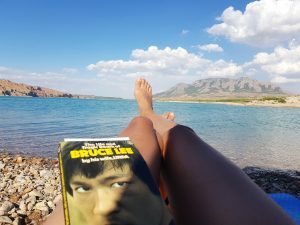 In the Embalse de Negratín, province of Granada in the fascinating Andalusía, Spain- I had the time and mind space to read The Life and Tragic Death of Bruce Lee by his wife Linda Lee. Linda’s memoir is an honest, straightforward account of a unique artist. For me, a revelation about the humanity and the paradox of Bruce Lee’s life, work and personality. Prior to this memoir I only knew Bruce Lee as a Martial Artist- Actor- Superstar and as a thinker of his own life philosophy inspired by oriental thinkers and spiritual leaders such as Buddha, Confucious and Lao Tzu. I imagined him as a Zen, chilled master- the embodiment of all he had read and probably interpreted in the writing of his own books. I’m yet to read some of Bruce Lee’s books to which I only have a glimpse from quotes and archive footage interviews on the web. He pushed himself beyond the limits of his body and emotional balance. Towards the end of his life, at the age of only 32, he couldn’t sleep because of his worries and commitments. He was a young man who strove for perfection and succumbed to life pressures, his strong drive and ambition. My interest in Bruce Lee stems from my love for martial arts. 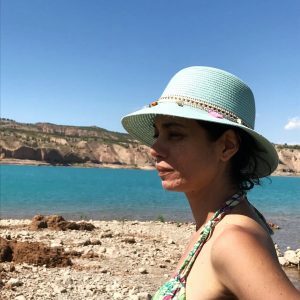 I practise Qi Gong and Tai Chi for self-development and healing. By no means as Bruce Lee who evolved from Kung Fu to his own martial style, Jeet Kune Do, amazingly performed in his films. It saddens me to believe that his philosophical knowledge and wisdom were applied to his martial arts and not to his life. I had to come to terms that his commitment to achievement in making his films and succeed as an actor and producer took its toll on his physical health and well being. I relate to many of Bruce Lee’s goals. I want to achieve in life and have a career as a web series creator-filmmaker-writer-actor, financially free and independent. I want to be acknowledged, to be an influencer and a service to people. Ultimately, Bruce Lee achieved everything he set his mind to achieve. I think he was aware of the law of attraction and practised it to the full. He did a great service in opening up the western mentality about martial arts and breaking stereotypes in the film industry. English was his second language and, to overcome the language/accent prejudice in the anglophone film industry, he trained to speak like a native American. I’ve been doing the same in Britain. Will the British film industry embrace foreign accents? Who knows… All I know is that I am ever more aware of The Tao and The Christ in my living. This keeps me in the present, in the constant reminder that all reality is in the now, in my mind and heart, with every breath I take. The Life and Tragic Death of Bruce Lee by Linda Lee has helped me to understand a unique human being and a great deal about the law of attraction.